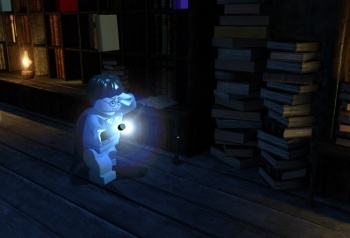 Solving puzzles as Harry and the gang fits perfectly with the Lego gameplay. Holding the B trigger button activated the spell, and the Wii remote controlled a green circle cursor. When pointed at the correct object, it lifted it into the air. Perhaps because it was early on in the game, a purple halo surrounded objects that could be lifted, clueing you in as to where to point the cursor. The puzzles involved lifting or moving objects in a particular order in true Rube Goldberg fashion - you moved a mechanical hand to hold a weight, which lowered a chandelier where a fellow student had been trapped, holding on for dear life. My favorite puzzle was a little difficult to solve, not because of the complexity but because of the Wii controls. You had to assemble a little Lego man by lifting the torso onto the legs, and then the head followed by the spear. The margin for error was extremely low, and only through very careful movements with the wii remote was I able to carefully set the torso on the legs. But, when assembled, the statue came to life and threw his spear under the counter weight, stopping its downward movement and allowing another student to go free. Once I'd completed all of the puzzles, I unlocked the lifting spell (whatever it's called) for use outside of the classroom. It appears that unlocking multiple spells is how you progress throughout the whole game. Overall, I think that the Lego game style of humor coupled with the puzzle-solving is a great formula for the Harry Potter license. I'm officially excited for when the game comes out June 29th in North America.